The Arctic Report Card (www.arctic.noaa.gov/Report-Card/) considers a range of environmental observations throughout the Arctic, and is updated annually. As in previous years, the 2016 update to the Arctic Report Card highlights the changes that continue to occur in, and among, the physical and biological components of the Arctic environmental system. Arctic air temperatures continue to increase at double the rate of the global temperature increase. The average annual surface air temperature anomaly (+2.0° C relative to the 1981-2010 baseline) over land north of 60° N between October 2015 and September 2016 was by far the highest in the observational record beginning in 1900. This represents a 3.5° C increase since the beginning of the 20th Century. Autumn, spring and winter showed extensive positive average air temperature anomalies across the central Arctic, primarily due to southerly winds moving warm air into the Arctic from mid-latitudes. Winter air temperatures greatly exceeded the previous record, with several locations showing January temperature more than 8° C above the norm. Contrary to conditions in much of the previous decade, neutral to cold temperature anomalies occurred across the central Arctic Ocean in summer 2016. The relatively cool summer air temperatures over the Arctic Ocean created a condition which did not support rapid summer sea ice loss. After experiencing the lowest winter maximum ice extent in the satellite record (1979-2016)—which occurred in March and was 7% below the 1981-2010 average—many anticipated a record summer minimum extent. Though no new record was set, the September 2016 Arctic sea ice minimum extent tied with 2007 for the second lowest value in the satellite record, at 33% lower than the 1981-2010 average. The sea ice cover continues to be relatively young and thin. In March 2016, multiyear ice (more than 1 year old) and first-year ice were 22% and 78% of the ice cover, respectively, compared to 45% and 55% in 1985. As the sea ice retreats more extensively in the summer, previously ice-covered water is exposed to more solar radiation. As a result, sea surface temperature (SST) and upper ocean temperatures are increasing throughout much of the Arctic Ocean and adjacent seas. Also contributing to the increase in SST are regional air temperatures and influx of warmer water from the North Atlantic and Pacific Oceans. The Chukchi Sea, northwest of Alaska, and eastern Baffin Bay, off west Greenland, have the largest warming trends: ~0.5° C per decade since 1982. In August 2016, SST was up to 5° C higher than the 1982-2010 average in regions of the Barents and Chukchi seas and off the east and west coasts of Greenland. Increasing ocean primary production (conversion of CO2 to organic material) is also being observed as summer sea ice extent declines, related to enhanced light availability. In 2016, there were widespread positive primary production anomalies throughout the Arctic Ocean and adjacent ice-affected seas, from 5% to 19% above the 2003-2015 average in Hudson Bay and the Barents Sea, respectively. The only negative anomalies were observed in the western (North American) Arctic (-11.9%) and the Sea of Okhotsk (-1.8%). For the period 2003-2015 there are statistically significant primary production trends in the in the eastern (Eurasian) Arctic, Barents Sea, Greenland Sea, Hudson Bay and North Atlantic; the steepest trends are in the eastern Arctic (37.9% increase) and the Barents Sea (34.8% increase). The waters of the Arctic Ocean are more prone to ocean acidification (OA) compared to the rest of the global ocean, due their cooler water temperatures and unique physical processes (e.g. the formation and melting of sea ice). Even small amounts of human-derived carbon dioxide (CO2) can cause significant chemical changes that other areas do not experience. Current data indicates that certain areas of the Arctic shelves presently experience prolonged ocean acidification events in shallow bottom waters. These waters are eventually transported off the shelf. As a result, corrosive conditions have been expanding deeper into the Arctic Basin over the last several decades. The inherently short Arctic food web linkages generate an increased urgency in the need to understand the impacts of OA on the Arctic marine ecosystem. Ice on land, as represented by the Greenland Ice Sheet, saw a continuation of the overall increasing melting trend in 2016, with enhanced melt occurring in the southwest and northeast regions. The onset of surface melt ranked 2nd (after only 2012) over the 37-year period of satellite record (1979 - 2016). The duration of the melt season lasted 30-40 days longer than usual in the northeast and 15-20 days longer along the west coast, compared to the 1981-2010 average. Consistent with the spatial distribution of melt anomalies, the largest area of relatively low albedo (a measure of surface reflectivity) was located along the southwest coast, reaching down to ~20% below the 2000-2009 average. The spring snow cover extent (SCE) has undergone significant reductions over the period of satellite observations (which start in 1967), particularly since 2005. In 2016, new record low April and May SCE was reached for the North American Arctic. The June SCE was the 3rd lowest on record over both the North American and Eurasian sectors of the Arctic. Warming Arctic surface air temperatures have a clear influence on the timing of snow melt. However, there is also evidence of decreasing pre-melt snow mass (reflective of shallower snow) which may pre-condition the snowpack for earlier and more rapid melt in the springtime. Satellite observations of tundra greenness (a measure of vegetation productivity and strongly correlated with above-ground biomass) are available since 1982, with 2015 being the most recent year with a complete data set. Long-term trends over this period show greening on the North Slope of Alaska, in the southern Canadian tundra, and in much of the central and eastern Siberian tundra. A decreasing trend in greenness, or "browning", is observed in western Alaska (Yukon-Kuskokwim Delta), the higher-Arctic Canadian Archipelago, and western Siberian tundra. Warming air temperatures in the Arctic are causing normally frozen ground (permafrost) to thaw. The permafrost is carbon rich and, when it thaws, is a source of the greenhouse gases carbon dioxide and methane. Northern permafrost zone soils contain 1330-1580 billion tons organic carbon, about twice as much as currently contained in the atmosphere. Tundra ecosystems are taking up increasingly more carbon during the growing season over the past several decades, but this has been offset by increasing carbon loss during the winter. Overall, tundra appears to be releasing net carbon to the atmosphere. Changes in the tundra environment also affect the fauna they support, causing species to shift their distributions, adapt to novel conditions, or die out. Because of this linkage, small mammals, such as shrews, and their parasites can serve as key indicators for anticipating the consequences of environmental variability and changing interactions among species. Some Arctic shrews have recently acquired new parasites indicating poleward shifts of sub-Arctic faunas, and demonstrating increases in both Arctic biodiversity and overall complexity within these novel species networks. In summary, there are numerous and diverse signals indicating that the Arctic environmental system continues to be influenced by long-term upward trends in air temperature, modulated by natural variability in regional and seasonal anomalies (Fig. 0.1). The acceleration of many of these signals, the interdependency of the physical and biological elements of the Arctic system, and the growing recognition that the Arctic is an integral part of the larger Earth system are increasing the pressure for more effective and timely communication of these scientific observations to diverse user audiences. A key to meeting this challenging goal is to more directly convey the syntheses of observations across disciplinary boundaries, to better highlight Arctic system change. Fig. 0.1. 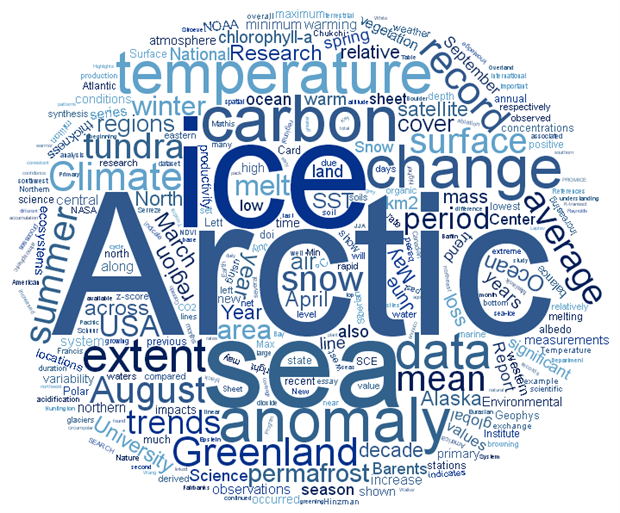 Wordle of 2016 Arctic Report Card. Created with http://www.wordclouds.com/. Financial support for the Arctic Report Card is provided by the Arctic Research Program in the NOAA Climate Program Office. Preparation of Arctic Report Card 2016 was directed by a U.S. inter-agency editorial team of representatives from the NOAA Pacific Marine Environmental Laboratory, NOAA Arctic Research Program, and the U.S. Army Corps of Engineers, Cold Regions Research and Engineering Laboratory. The editorial team was assisted by the Editorial Advisory Board. The 12 contributions to Arctic Report Card 2016, representing the collective effort of an international team of 61 researchers in 11 countries, are based on published and ongoing scientific research. Independent peer-review of the scientific content of Arctic Report Card 2016 was facilitated by the Arctic Monitoring and Assessment (AMAP) Program of the Arctic Council.